With Thanksgiving coming up, here’s one thing you can bring to the table, and it won’t even make a mess in the kitchen or add calories to the waistline: a digital recorder. I don’t know how many times I’ve sat around a table with loved ones, and have wished I had a recorder! There’s something about sharing a wonderful meal as a family that brings out the memories, the nostalgia. That gets people talking. Gone are the days of the clunky tape recorder. Today’s recorders fit in a pocket, are easy to use, run on batteries for a long time, and are relatively inexpensive. I got the one I use for my business at Wal-Mart for under $100. What’s the proper etiquette for recording stories? Just make sure everyone knows that they are on record, and press the record button. If they seem skeptical, tell them that you want to save the stories before they are forgotten. Some people may feel self-conscious, but in due time, the stories will keep coming and then you will have gems to add to your files. After the holidays, you can transfer your recording onto a disk for safekeeping, distribute it among family members, or transcribe it. 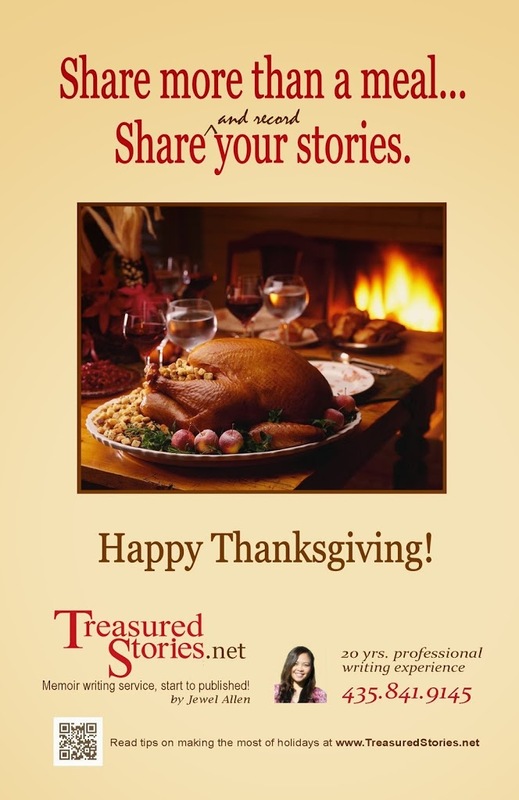 It may seem really silly right now to record raw conversations around the Thanksgiving table, with all the chit chat, but someday, when your loved ones are no longer there to tell those stories first-hand, you will be so glad you did! Want to put those family memories into a beautiful book? Contact us for a free Treasured Stories consultation.